The editors among us who have families were glad to see another SUV/wagon-type vehicle enter our extended-use fleet. We were especially happy to welcome Audi's polished Q7 to our collective garage. Named a Consumer Guide Recommended choice for 2007 and 2008, the Q7 balances power, handling, and refinement in a way few trucks do. Though mechanically similar to Volkswagen's Touareg, Audi eschewed any pretense of serious off-road capability, focusing its efforts on on-road prowess instead. The result is large-truck space combined with midsize-car ride and handling. Noting that even the well-heeled are looking twice at gas prices these days, we requested that our Q7 include the 280-hp 3.6-liter V6 engine. None of our editors have found power wanting, though some have noted that the available 350-hp 4.2-liter V8 trumps the smaller engine for overall smoothness. Not that the V6 is coarse, just a little less refined than might be expected in a vehicle that can sell for more than $50,000. Our Q7's interior is a mixed bag. Seat accommodations front and rear are first rate. Materials quality is generally up to Audi's high standards, save for a few hard-plastic door panels. Most audio, climate, and navigation controls are governed by Audi's Multi Media Interface (MMI) console knob. None of our editors like the way it functions. Tasks such as programming radio station presets are frustratingly complex on the Q7. Otherwise our Q7 has done its job without complaint or complication. Even our fuel economy has us smiling. Our average of 17.1 mpg is exceptional for a large SUV, though Audi recommends expensive premium-grade fuel. We look forward to rolling up many miles in this large German family hauler. Ed Piotrowski: Q7 has an understated elegance that should appeal to premium SUV buyers. Though plenty powerful, the V6 powertrain leaves a bit to be desired in terms of overall smoothness. Audi's MMI control system wins no prizes either for needlessly complicating what should be simple audio, climate, and navigation adjustments. When shopping against competitors such as the Cadillac Escalade or Mercedes-Benz GL-Class, seek the non-Premium Q7 4.2 quattro model for its superb V8 powertrain. If you desire a navigation system, a portable 3rd-party unit will be easier to operate and less expensive than what Audi offers. You'll still have to deal with MMI but only for audio and a few climate controls, which is definitely tolerable. Damon Bell: Our long-term-test Q7 strikes a fine balance between a smooth ride and crisp (for a large SUV) handling, thanks in part to its $2,600 Adaptive Air Suspension. The V6 also moves it with reasonable verve. Dynamically, the Q7 impresses, but ergonomically, its MMI system can annoy by turning simple climate and audio functions into multiple-step procedures. Jack Stewart: Although we class the Q7 as a Premium large SUV, its interior room feels midsize. 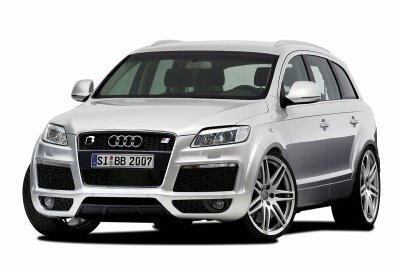 The Q7 drives well for an SUV and has plenty of gadgets, but its hard to justify the $54,000 price of our test vehicle. Rick Cotta: On purely practical grounds, it's hard to justify the Q7's lofty price. Any number of less-expensive SUVs offer similar or better performance and accommodations, without the complexity and aggravation of the MMI control system. Some might be lured by the Audi name and the Q7's admitted panache, but the sum of its qualities falls short in a value equation. geogen a écrit : " TQr0MG http://www.dnHd8mjtdfj3qnc48Mws2p.com "
Follow those steps to create your own successful trade on-line: On web page gives you a professional presence on the Internet to tell people who find themselves serious and in a position for business. Personally, I will placed the squeeze on my website and use it to get a list that I will be able to marketplace many times. Thank you for the work you have done into this article, this helps clear up some questions I had.